The City of Woodlake’s new Plaza, designed by TETER Partner and Architect Stan Canby, is featured in the “Project Focus” section of the June 2018 edition of Metal Construction News. 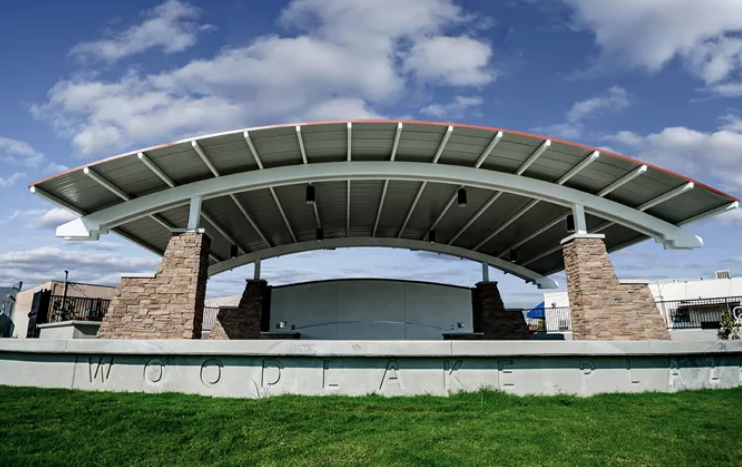 “A pavilion amphitheater stage and entrance structures at Woodlake Plaza coordinate with other redevelopment projects in the City of Woodlake’s downtown including transit center shade structures and a planned community center, which is adjacent to the plaza. All the projects have stone, plaster and tile roofs. Additionally, the pavilion roof color, Cool Terra Cotta, is consistent with the transit center’s terra cotta tile roof and the future community center’s roof color. TETER LLP designed the pavilion as a light, airy shape that emphasizes its steel structure and metal roof deck. It has cantilevered steel columns that rise from large stone buttresses. The columns support a pair of radius steel beams with 10-foot-long, cantilevered tails. The radius beams and tails support cantilevered steel purlins. Bradford Steel Construction Inc. fabricated and erected the 10-ton structure including columns, radius rolled beams with 10-foot cantilevered tails and purlins. Jim’s Supply Co. Inc. supplied the structural steel. To construct a curved roof for the pavilion, Four C’s Construction attached standing seam panels to the purlins. The company installed 2,000 square feet of AEP Span’s 24-gauge, 16-inch-wide Select Seam Narrow Batten metal roof panels in Cool Terra Cotta. Advanced Metal Works Inc. fabricated and installed gutters and trim. TETER also designed two entry structures to the plaza, which is at the base of the Sierra Nevada mountain range, with architecture similar to the pavilion. They have steel columns rising from stone buttresses. Attached to the columns are radius tube steel beams and cantilevered tails in-filled with flat sheet steel. Bradford Steel Construction fabricated and erected the entry structures, which is painted to match the pavilion.